Learn to Sculpt Hot Glass! In this hands-on small group class you will learn the basics of hot glass sculpting techniques. Each student/artist will sit at the bench and work with our team to create their very own unique solid glass art. Choices include Hearts, Flowers, Paperweights, Starfish and more. Check the calendar for current offerings. Minimum age for most hot glass classes is 9 years. All tools, materials and supplies are included, unless otherwise noted. No prior glass blowing experience required. 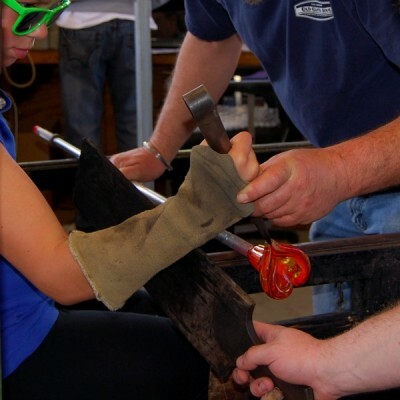 To work safely in a glass blowing studio remember to wear closed toe shoes and loose fitting cotton or natural fiber clothing NO short shorts or short skirts. Bring water to stay hydrated, sunglasses and sunscreen if you have sensitive skin. 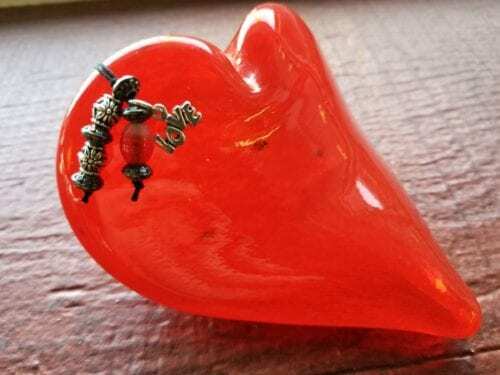 In this small group class you will work with our team to create a unique hot glass sculpted heart. Experience the thrill of working with hot glass to create your own unique solid glass egg. In this small group class you will work with our team to create a unique solid hot glass sculpted paperweight.